GameSir never stopped the pace of innovating products to raise and satisfy customers' gaming experience. All the mysteries are hidden in this easily portable oval-shaped gaming hardware: GameSir F2 Firestick Grip that will bring out the Sniper in your blood. Preserve Your Account, Just Fire! Be kicked out from games? Account gets banned? 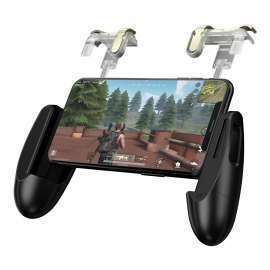 No worry for GameSir F2 Firestick Grip! Unlike other gaming peripherals, when playing with GameSir F2 Firestick Grip, a hardware peripheral, the game won't detect you as a emulator player so that there's no risk of being kicked out of the game or accounts being banned. The two separated shooting clips, light and convenient, can can be firmly fixed on the mobile phone to best assist with micro-operations that are easily neglected by hand control. They enable you to simultaneously shoot from both sides while switching angles. GameSir F2 Firestick Grip adopts polished metallic anti-scratching shell. Its ergonomic design is incomparable so that it reduces the hand fatigue due to long gaming sessions. GameSir F2 Firestick Grip also allows gamers to charge and plug in earphones while playing. GameSir F2 Firestick Grip is super easy to setup. Its "egg-like" shape can be separated and assembled into a stretchable grip that fits any smartphones from 4.5 inches to 6.4 inches. Simply separate the "egg", stretch it to the size of your phone, put the clips on top of your device and you are ready to go!